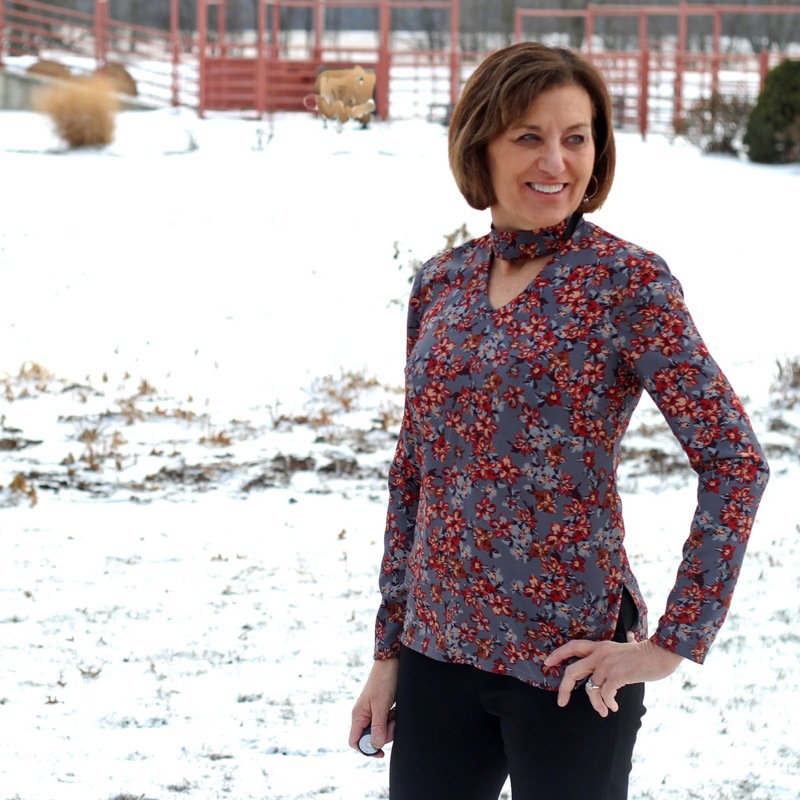 I love this blouse and at the same time think, wow, this is a really different look for me! Different is good, right? 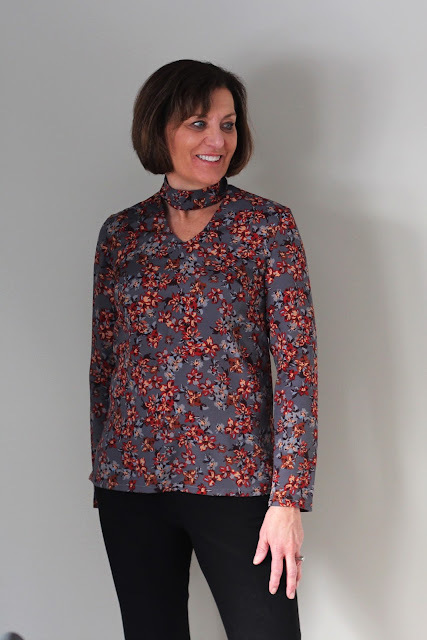 This pattern is Simplicity 8425, with a dress, tunic and a top. I went with the top and a size 12, which is the largest size in the multi-size range (4 to 12). When I read the finished measurements, oops, this will be too tight. I graded out the side seams and underarm seams to match my side seam grading. On a sizing note, about 98% of the time in the Big 4 patterns I make a size 12. So this was a surprise when I saw the finished measurements. My fabric is from IndieSew - a poly crepe, this fabric was a dream to sew and the drape is perfect for this pattern. 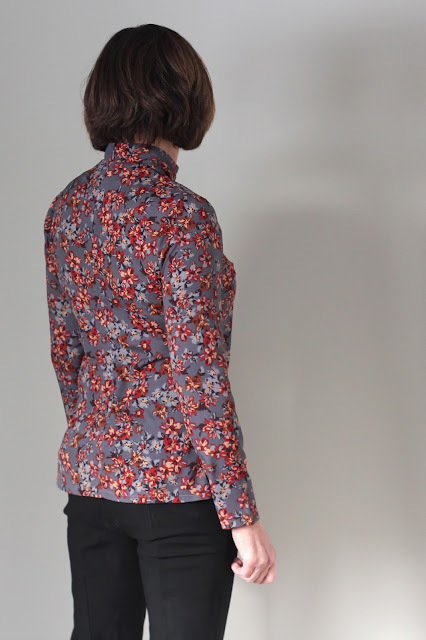 In the Simplicity patterns, I have sewn the last year, the sleeves run short. I have added 1" in the past to the sleeves, I added 1-1/2"this time. So if you are tall or have long arms, check the sleeve lengths on your Simplicity patterns. The temperature outside was -10 with the windchill, so I took several inside but they just aren't the same as outdoors. I took about 4 very quick outdoor photos just to get a few good photos. 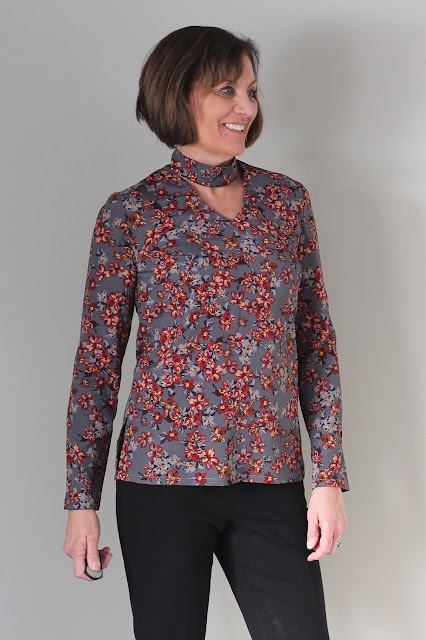 Remember this top runs small and slim, but it does have an invisible zipper from the top of the neck to almost the bottom of the garment. The pattern calls for a 22 inch zipper. 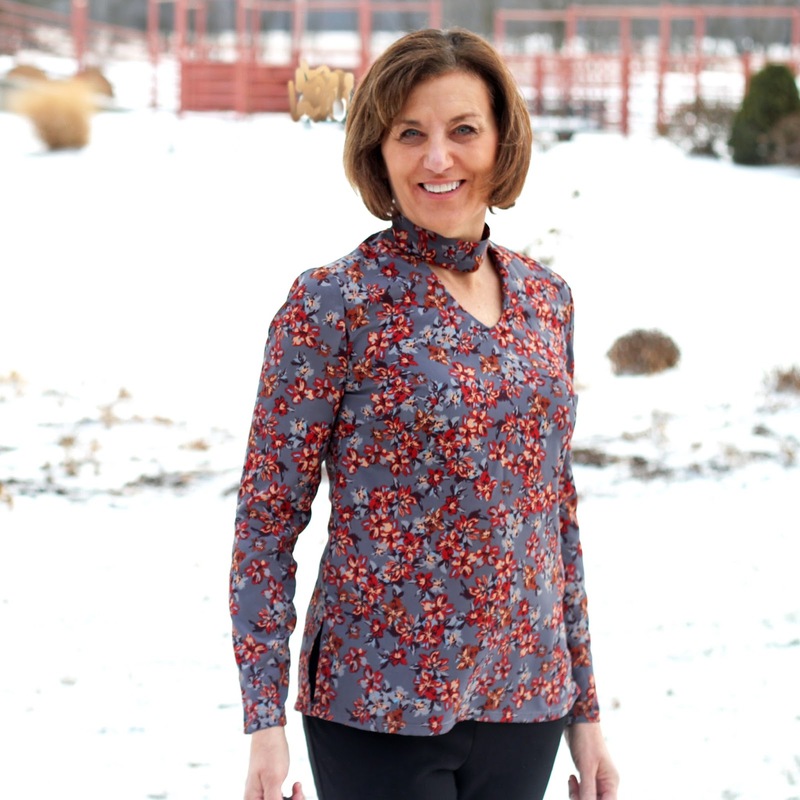 I love this feature and makes this woven top become a close-fitting top. I find only one thing wrong with a long zipper, it is hard to zip it up my yourself! The pattern has a wide and very low v-neck. I didn't want this, instead more of a conservative keyhole type opening. I used a Loft top for my guide. Here is how I altered the front pattern piece, which also means the back has to be adjusted. Here is the neckline up close. The neckband is a bit loose but I am great with that, I don't like anything choking me! The pattern wasn't hard to sew, just a bit tedious with the neck band, front opening and the invisible zipper and oh, wait the side slits, too. I love this top, it will be fun to wear on date nights. I also think it can be dressed down with my rust Blackwood Cardigan and I have a rust RTW cardigan chunky sweater. 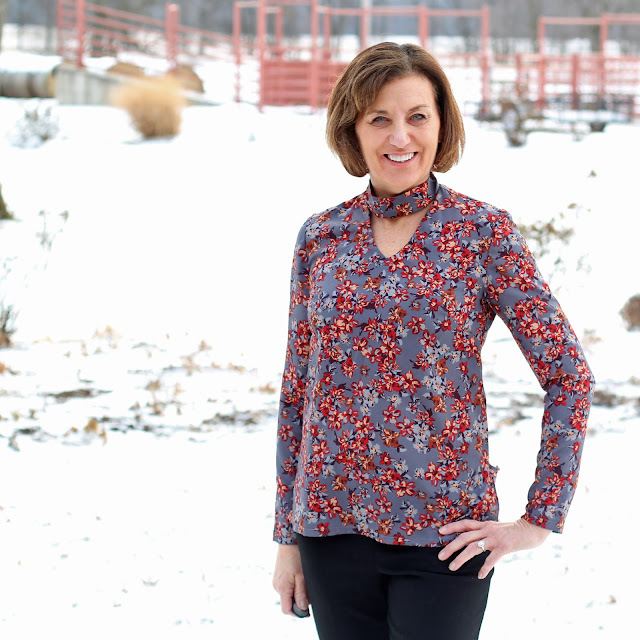 I am thrilled with this top and a different look for me. What have you sewn that is different from your normal style? Sehr schön! You look good! Love the choker detail and fabric print. I absolutely love this Lori. I'd wear it any old time casually or date nights, it's fab! The colours suit you so well too. Love the design detail on this pattern. Looks great on you. Stepping a little outside your comfort zone is a good idea from time to time - makes for a more interesting wardrobe, I think. You are right, Irene, it is good to put these type garments in your wardrobe. Fun to wear something different. Such an enabler. I have ordered this pattern because they no longer sell Simplicity in Canada, but this one was irresistible. I love your new top! It looks great on you! !